Doreen has now updated her first book after more than 30 years. 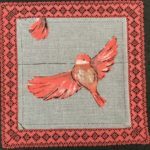 It is a book for beginners with introduction to the basic techniques, with designs, clear step by step instructions and photographs of the finished projects. There is also a section of projects for the more experienced and Tips and Tricks! Clearly set out, this book will guide beginners and be a great reference and provide inspiration for the more experienced. The main difference I see is that instructions are now in point form which makes the steps easier to follow. The sentence / paragraph structure of the initial printing is tedious to browse, but that was the current style of the day and is now revised and improved. 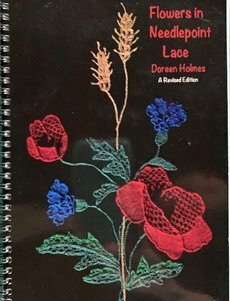 Doreen is an experienced teacher of needlelace, and I am sure has relished the opportunity to review and modify the book to make it easier to use and more up to date with her current methodology. It is definitely easier with a spiral binding that allows the pages to lie flat beside your work. This book has 123 pages spiral bound and is easy to follow.